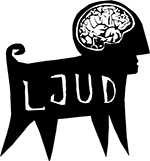 LJUD is a collective of idealists from very different backgrounds who have gathered to change the world through the medium of art. We believe in theatre as a “living” phenomenon that must be in direct contact with the present times. Playing with the “fourth wall” between the actor and the audience is vital for the group in order to establish theatre performance as a game, a ritual and a social event. We are currently focused on performing in public spaces, combining different media, genres and techniques, but you can also find us making music, films, writing, DJ-ing, gardening, playing chess and practicing levitation. Since 2006 we have also been developing new approaches to educational, social and environmental projects. We have even initiated a European project for new artistic mobility called H.O.M.E. – Houses for Open Mobility Exchange.